Musings of a Durotrigan: EDL Walthamstow Demo Cancelled: will the EDL demonstrate elsewhere? EDL Walthamstow Demo Cancelled: will the EDL demonstrate elsewhere? Today the EDL have been banned from protesting in Walthamstow, but given that in the past small groups of EDL have turned up at a variety of locations - such as Hebden Bridge and Totnes - for impromptu flash demos, will such activity take place today? It had been suggested that the EDL could protest outside of Parliament instead, but whether anyone will take up the offer to do so is unclear. If information emerges, from whatever source, it will be posted here as it becomes available. However, for some reason the SWP front group We are Waltham Forest and its umbrella UAF campaign have been exempted from the protest ban in the borough, and this morning therefore gathered for a static protest - a self-billed "victory" rally - in Walthamstow town centre. Around 250 are said to have attended. However, the deeply unappealing prominent UAF member and anti-free speech activist Martin Smith claimed that they numbered over 1,000. Quite why UAF is not seen as a threat to public order whereas the EDL is when activists associated with the former have instigated a great deal more violence than the latter over the years, is something of a mystery. For some reason, although UAF is under de facto SWP control, David Cameron continues to support the campaign. The anti-EDL Hope Not Hate blog reports that a number of EDL were drinking in St Stephens Tavern near Parliament at the beginning of this afternoon, with representatives of the Dudley, Exeter, Portsmouth and Torbay divisions being present. It looks as if Totnes will not be getting a visit from the EDL today. The numbers are said to be "low". Compiling estimates of numbers in various Hope Not Hate postings, their blog is claiming, as of 13:33, that the EDL number circa 100. It also states that a number of "anti-fascists" [sic] have turned up to oppose them. As the police have not given these agitators the right to protest near Westminster today, will they deal with them appropriately, for they have clearly turned up with a view to provoking conflict with the EDL? 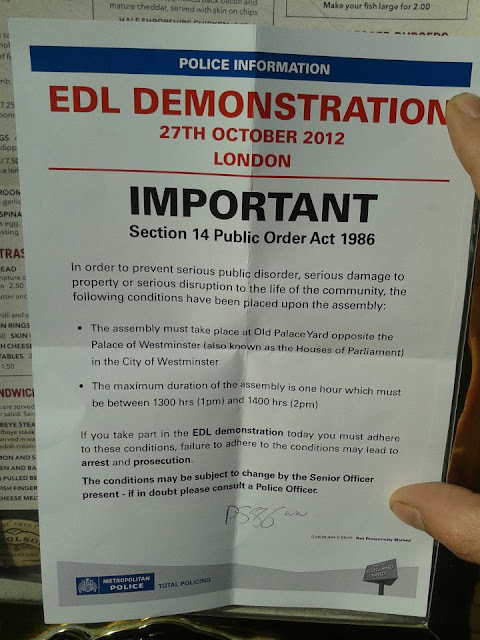 The Casuals United blog has posted an image of a leaflet handed (shown below) out to EDL protesters by the police at King's Cross. As can be seen, they have been instructed to demonstrate in Old Palace Yard opposite the Houses of Parliament between 1pm and 2pm only, with the leaflet stating that the demo had to take place there instead of in Walthamstow "to prevent serious public disorder, serious damage to property or serious disruption to the life of the community". It would be interesting to know what intelligence the police had received pertaining to the likelihood of such violence erupting in Walthamstow and who was behind any associated threats. It seems unlikely that they would have originated with the EDL. Despite the EDL not being in Walthamstow this afternoon, one tweeter by the name of Henry Comfort claimed at 13:13 that nonetheless police in riot gear were "eveywhere in Walthamstow today". The Waltham Forest News reports that UAF supporters this afternoon violated the ban on marches in Walthamstow, with several hundred of them breaking away from their static protest at 1.30pm to march down to the junction at Selbourne Road. There, the police stopped them, and scuffles broke out. Clearly, had the EDL come to Walthamstow today, it would have been the UAF demonstrators who initiated any violence. By 2.30pm the UAF marchers had been dispersed. Reform Section 5: why is the BBC silent? Ahmed and Ahmed: Bradford’s New Terror Duo?